AW@L Radio - Criminalisation and Harassment of LGBTQ Prisoners in Kitchener's Federal Prison. A summary of the "Being Queer is Not Illegal" campaign at the Federal Jail in Kitchener, and wrongfully convicted GVI prisoner Nyki Kish reads one of her new blog posts. Download Audio: Criminalisation and Harassment of LGBTQ Prisoners in Kitchener's Federal Prison. 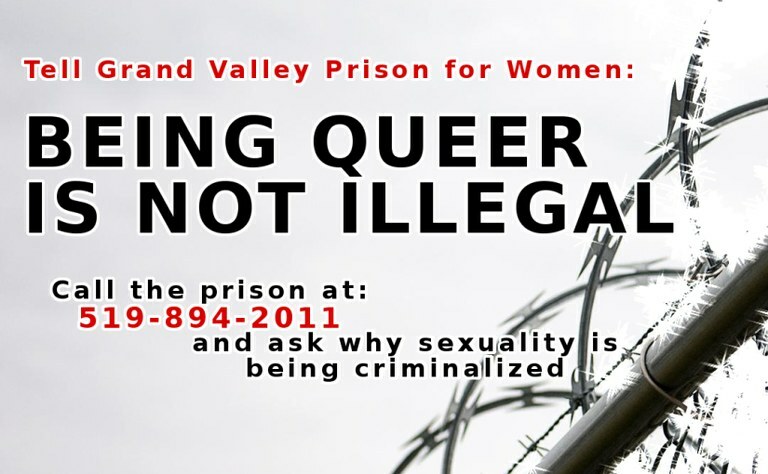 December 15, 2015 -- In early November 2015, the "Being Queer Is Not Illegal" campaign was launched by prisoner solidarity group GVI Watch. The group, acting in solidarity with the prisoners held at the Grand Valley Institute (GVI), a large federal prison for woman in Kitchener Ontario, was asking people to phone into the prison after prisoner reports of surging harassment , discrimination, and criminalization of LGBTQ prisoners by guards. "a recent crackdown against LGBTQ2+ prisoners and/or prisoners in relationships amongst themselves. Intimate relationships between prisoners are being attacked by a clique of guards acting without apparent direction or oversight from the Corrections Canada administration." The post continues: "Harassment of prisoners includes throwing them in solitary as punishment for being in a relationship, threatening them with transfers to remote parts of the country, separating partners by placing them in different parts of the prison, and laying spurious institutional charges that can lead to being locked in the maximum security unit. Most troublingly, guards have been using physical intimidation and invasions of personal space to harass prisoners who speak up against these practices. In violation of their own rules individual guards have been entering prisoners’ cells at night,with an institutional history of sexual violence and exploitation of prisoners by guards at GVI, this can only be understood as a threat." The post goes on to describe a growing culture of impunity among guards and prison officials as the jail is without a warden and the federal prison investigator has not had his contract renewed, which GVI watch says is "leaving no one to respond to grievance reports filed by prisoners." While the prisoners themselves have been organising on the inside, their efforts have been met with repression from the guards. GVI watch reported on November 17 that the pressure from the call-in campaign was working, with prison officials stating they would allow an LGBTQ2+ group to form among prisoners. "The issue of the criminalization of queer prisoners is still ongoing though, so stay tuned! - Some institutional charges have been dropped against queer prisoners, reducing their daily stress, but some charges remain"
The group concluded their post: "GVI Watch is thinking about the folks inside, and hoping those who are allowed to attend the holiday Family Day event have a great day." Today AW@L Radio is grateful to present a recording of Nyki Kish reading her piece "The Criminalization of LGBTQ People in the Grand Valley Institution for Women Part I – Our Story"https://changeandprison.wordpress.com/2015/11/26/the-criminalization-of-... . I want to thank Nyki for her courageous efforts in documenting her struggle and spreading her experiences and critiques from inside the jail, and thanks as well to those who recorded and sent AW@L Radio this powerful piece of audio. This has been AW@L Radio, i'm your host @dankellar, thanks for listening.